Kifco Water-Reels are an effective choice for your sports fields and parks. Water-Reels operate unattended, shut off automatically and require minimal labor. Water-Reels are ruggedly made, are an excellent low-cost alternative to in-ground systems and require far less labor than the conventional portable systems. Water-Reels can be transported easily from field to field by hand or with a lawn tractor. Kifco Water-Reels are a solution to providing safe playing conditions for your athletes and lush, green turf for your parks. There are several sizes of machines available. Mega TowerTM , Miracle's latest play system breakthrough, is among the only multi-level octagonal play structures offering great features and options like a dramatic three-level system with oversized decks at 14-foot, 8-foot and 2-foot levels. Junior Towers feature stacked hexagon decks at 8-foot and 2-foot levels. The unit includes up to 77 square feet of roomy play space with as many as eight play activities off each deck. More than 400 exciting play event options include 14-foot tube slides and multicolor 8-foot chameleon slides. Compatible with Miracle's Center Stage®, Kids' Choice® and Tots' Choice®, Mega TowerTM offers tremendous customization and flexibility. Vortex Aquatic Structures presents the Aqualien. Vortex understands form, function, design and, most importantly, play. By combining organic shapes with the innovative Seeflow Polymer, Vortex has created the Aqualiens. 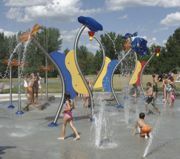 The Seeflow Polymer material was developed exclusively for Splashpads. A thermoplastic Seeflow is impact-resistant, chemical-resistant, UV-stable and crystal-clear. The fun shapes inspire imagination, and the see-through Seeflow materials allow children to anticipate nonstop thrills and spills. The Aqualiens help elevate the design of any Splashpad to out of this world. Speedy Bleachers offers the new 10-row bleachers with automatic folding guardrail and ADA space option. Speedy Bleachers are among the best highway-towable, hydraulic folding bleachers on the market. Kay Park has been making nine-row units for many years and now offers the 10-row unit to allow for more seating in the same amount of space—with the same full 24-inch row spacing for patron comfort. The new design allows the fully attached guardrails to unfold right along with the seating section, which takes just two minutes. ADA spaces can be installed. 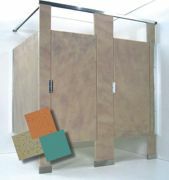 Comtec has added several new colors to its EverTuff solid plastic restroom partitions, making it easy for you to achieve great designer looks for your restrooms. Impressions offer the look of marble, stone and speckled patterns to help create a natural-looking environment with eye-appealing finish. Classics feature time-tested solids enhanced with fresh bold colors that add vibrancy to any décor. All colors are homogeneous throughout, and EverTuff products have a self-lubricating surface that cleans easily and is graffiti-resistant. All are water-resistant, as well as corrosion-resistant and impact-resistant, making them virtually maintenance-free. Take your playground to the next level with the MaxClimb Keystone Cable Climber by Park Structures. The MaxClimb Keystone Cable Climber is a truly innovative combination of cable and sculpted plastic that is available as an attachment or as a freestanding item. The climber is challenging and fun for children, while allowing supervisors full visibility through panels with a special open handhold design. The component offers solid-surface vertical and lateral climbing, as well as cabling that creates a different experience with each step. Future Pro's new B-B Easy-Up Youth Goal can change your gym or multipurpose room from adult to youth basketball in minutes. 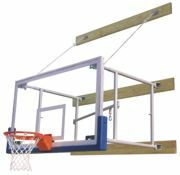 Already used at more than 20,000 schools, churches and recreation facilities, this backboard and goal combination can be installed by one person from a step stool, over any style or make of goal and backboard. No tools are required, and it won't damage existing goals. Choose a fixed height or the new 5-in-1 Adjustable Easy-Up that moves from 6-1/2 feet to 8-1/2 feet. 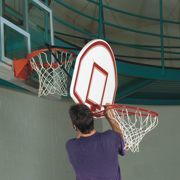 All have a 48-inch-by-32-inch backboard of high-impact ABS plastic with a lifetime limited warranty. Bison has improved the ordering and measuring process for wall-mount basketball systems. Unlike custom-built wall structures that require long lead times, Bison's innovative telescoping extension design allows the installer to put the face of the backboard exactly where it needs to be in relationship to the existing court layout. Swing-up, side fold or stationary structures with extensions up to 12 feet can be ordered packaged with backboards, goals and backboard padding to fit exact needs. Time-consuming measurements and costly field modifications are eliminated. These complete wall-mount structure packages are in stock for immediate delivery.